Entertainers is a plugin that adds the option to entertain the patrons of the Eight Plates in Balmora for Dulnea Ralaal. You can perform a variety of tricks to receive a small cash reward. 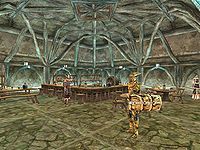 Dulnea Ralaal at the Eight Plates in Balmora will hire you as an entertainer, giving you option to tell jokes, dance the handy high-kick, play the drum, play the lute and sing, or juggle. To do the task successfully, you must have the appropriate skills and items. For instance, to successfully play the lute and sing, you need to have a lute with you and a high speechcraft skill. If you do a good enough job with any of these tasks, she will reward you with up to 100 gold. Entertaining will also affect your Disposition with the patrons (and not always for the better if you lack the skills). You can only entertain the patrons once a day. There are four factors involved in telling good jokes. Personality — If you want to win them over, you've got to be likable. Speechcraft — Being glib of tongue never hurts either. Appearance — Just because you aren't funny doesn't mean you can't be funny-looking. Wearing a Colovian Fur Helm is a good way to get some laughs out of the patrons if you don't have the skills to do it otherwise. Material — So you wouldn't know funny if it hit you on the head. So why not just steal from somebody who does? Like the self-proclaimed "Funniest Wood Elf Ever". Find a copy of his book I'm My Own Grandpa. You can buy it at Jobasha's Rare Books in Vivec, or get it from the Bosmer himself, who can be found around Ebonheart. Rumor also has it that your old pal Fargoth is a big fan of his. You'll need three things to perform this traditional Dunmer dance. Acrobatics — You've got to be light on your feet. Athletics — The handy high-kick is a tiring dance, so it helps to be fit. A Bonemold Shield — Wait, you didn't know that the dance simply has to be done on a Bonemold Shield? That's the most important part! Any style of Bonemold Shield will do, including guard shields, and even enchanted ones — but only if they're already enchanted. You cannot use a shield you enchanted yourself. Three factors determine your prowess as a drummer. Speed — Audiences are always blown away by a lightning fast drum-solo. Agility — But you've also got to have some skill — just being fast won't do it. Drums — The more the better. Regular Drums or Guarskin Drums will work just as well. Try to have at least four of them for the best reaction. You'll need five things to succeed as a singer. Personality — Never underestimate the value of stage presence. Agility — You also need skill with your instrument. Speechcraft — It also helps if your voice is pleasant to listen to. A lute — Well, it's somewhat hard to play the lute if you don't have one, isn't it? Either a regular lute or one of the legendary Fat Lutes will do. A song — What is the singer without the song? Pick up a copy of either The Balladeer's Fakebook or The Battle of Molag Beran from your local booksellers. Jobasha's Rare Books in Vivec has both for sale, though there are copies at several other booksellers as well. Note that you only need one of these books. The Battle of Molag Beran is the most popular among the Dunmer. There are three juggling acts you can perform. You'll either need 3 Small Kwama Eggs, 4 Large Kwama Eggs, or 5 Ceramic Bowls. Whichever you choose, you'll need to have some pretty respectable Agility, unless you want to make a real mess. This page was last modified on 19 October 2018, at 20:08.